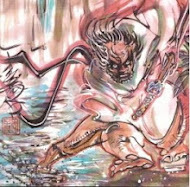 Panel 1: where we see that the clock is the one just above the entrance to Madison Square Garden, where the Pale Horse/Krystalnacht concert was letting out as Adrian Veidt’s faux alien monster teleported in, self-destructing upon impact and causing the devastation visible here. Notice the now-familiar shape of the blood spatter (from the Comedian’s smiley-face button) on the dislodged door with the concert poster. It is worth noting that this is the very first full-page splash utilized by Moore & Gibbons in this entire story. The regular 9-panel grid these artists use throughout the initial eleven chapters – with multiple deviations from that pattern for certain narrative effects – has been building to this moment. This large, single image effectively communicates the gravity of the moment –enhanced by the choice to offer it without captions or dialogue. Coupled with Dave Gibbons’s meticulous detail, readers are almost forced to pore over the page, the horror of what has transpired seeping slowly in. It’s a deft use of the comic page made all the more powerful by that adherence to the 9-panel grid throughout the rest of the narrative. 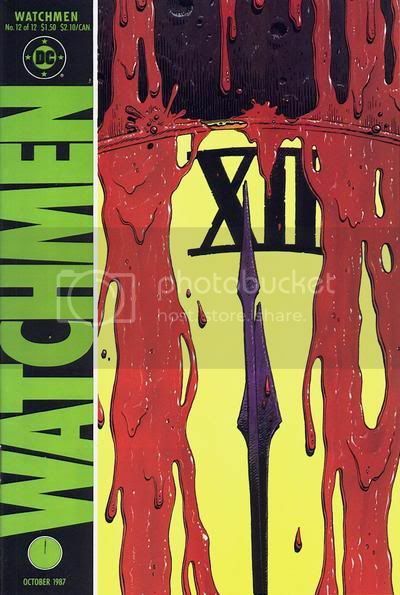 Labels: Alan Moore, Chapter 12, chrisbeckett, cover image, Dave Gibbons, Page 1, Watchmen, Who Watches the Watchmen?